Mike Guillory finishes his usual morning beach run on his family-owned Plover’s Island and notices that the sky and water are a strange shade of green. Unusually hot and humid for early March, this odd weather event climaxes in a bizarre late-night storm. The next day, Mike, his family, and their dogs, Travis and Poo, wake up to the beginning of a new and menacing world. Bud Santora is a versatile designer and illustrator. For his work as a costume designer he’s won an Emmy Award and two nominations. As a holiday designer he’s worked for companies such as Sears, K-Mart, and Silvestri. He’s created covers for numerous novels and has also illustrated the children’s picture book, Wise Bear William: A New Beginning. Currently he does freelance design and resides in New York City. 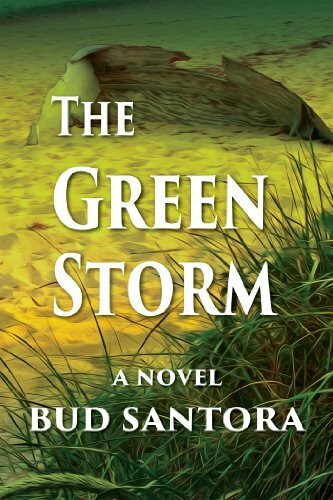 The Green Storm is his debut novel. Thanks to Bud for sending info about his book! Please visit the Green Storm website for more information. William, the first Guillory to live on the island with his family in 1908, sees his life change with a tragedy linking him to the ancient mermen creatures living deep within the sea and then with an eccentric group of theatrical people and their new enterprise, a carnival of curiosities. His relationship to these two situations intertwines and changes his destiny. Over the next several decades, the events of the past and the present link the little island and the Guillory family to a worldwide occurrence that is first felt the night of the storm but secretly had begun years earlier in the depths of the waters off the island’s shore.